FCB52 is a stem head ferro concrete barge built in 1941 by Waites Construction at Barrow-in-Furness. In the post war period she was used by the carriers G T Beard on the Sharpness to Gloucester Canal. She was beached in 1965 as part of the Purton Hulks, a collection of vessels that were beached to protect the banks of the River Severn from erosion. 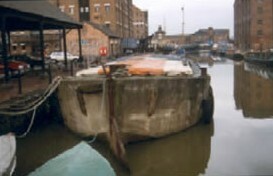 The barge was removed from the Purton site in 1990 and taken to Gloucester Docks as an exhibit at the museum of the Waterways Trust. She was afloat on the Sharpness to Gloucester Canal at Marshfield but reported sunk in October 2012.